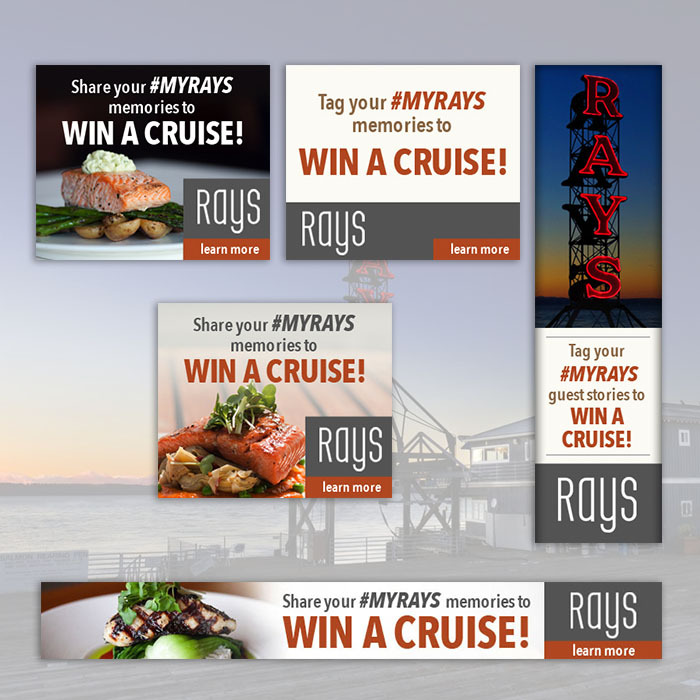 CMA’s social media marketing team helped iconic Seattle restaurant Ray’s Boathouse & Cafe perform a month-long social media promotion centered around the phrase #MyRays. Ray’s gave away weekly gift certificates and ultimately a seven-day Alaskan cruise to lucky guests who shared their favorite Ray’s memories on Facebook, Twitter, and Instagram with #MyRays. The #MyRays campaign was a huge success, garnering over 2 million ad impressions, 1 million hashtag impressions, drawing hundreds of entries, and increasing website activity by 50% during April 2015. CMA, in collaboration with Evado PR, boosted the buzz around #MyRays with organic posts, Facebook ads, Twitter ads, and a Google AdWords campaign. We also created a customized, moderated social feed on the Rays website which aggregated #MyRays content from Facebook, Instagram and Twitter, along with screen content on location at Ray’s. As an independent marketing agency in Seattle, it was an honor to help promote a legendary destination like Ray’s Boathouse & Cafe. The waterfront restaurant and bar has been an iconic seafood eatery for locals and visitors alike for more than 40 years.